Sling TV Reviews - Is it a Scam or Legit? Sling TV is a streaming service that allows you to watch content from networks like ESPN, HBO, HGTV, Food Network, TNT, and more, without a cable subscription. Sling TV is a streaming content company that provides access to live TV, sports, hit shows, movies, and breaking news from dozens of popular networks, in addition to on-demand new releases—without a cable subscription. If you’re tired of paying $100 or more per month for your cable subscription and are thinking about cutting the cord, there are some important considerations you should keep in mind about Sling TV. With this said, let’s start by talking about what “cutting the cord” even means. Despite the fact that your cable subscription might provide access to hundreds of different channels, the reality is that you probably watch less than 10% of these on a regular basis. And considering that the average American pays $1 per month for their cable bill, this means you’re paying a lot of money for content you’re not even using. Basically, you’re throwing money out the window. Factor into this equation that cable rates have risen an average of 9.4% per year since 2011, and you’ve got an increasingly costly monthly expense that’s not fully utilized. While this basic explanation should point you in the right direction, we’d recommend reading our Guide To Cutting the Cord for more in-depth information. If you’re thinking about cutting the cord though, you have to remember that each streaming service comes with its own set of pros and cons. Let’s explain what we mean. What Kinds of Content Can You Watch with Sling TV? Although cutting the cord can save you a ton of money, it’s not a turnkey solution. In other words, although you only watch about 10% of your cable channels, all your content is in one nice, neat package. Simply turn it on, change the channel, kick back, and relax. However, once you cancel your cable subscription, you’ll likely have to subscribe to other services if you want access to even remotely the same amount of content. Although we’ll provide more detail shortly, take the following as an example: If all your favorite TV shows are on Comedy Central, you might need to choose a service like Hulu Plus, but if you’re more interested in watching documentaries, a service like Netflix and/or Amazon Instant might be more up your alley. On the other hand, if you can’t live without some premium cable channels, Sling TV might just be your best bet. We’ll wrap up this section with a better look at this, but let’s first talk about the competition. Netflix offers subscribers access to a range of newer (and classic) movies and TV shows, in addition to award-winning original content, although there can be a significant lag between a movie or TV show’s release date and when it appears on Netflix. On the other hand, Hulu Plus features only TV shows from major networks (as well as a limited number of movies and original content), although their content is generally available within 3 days of the air date. Amazon Instant is another popular option for cutting the cord, as you’ll get access to thousands of movies and TV shows, from documentaries to soap operas. But unless you pay for the newest on-demand content, as with Netflix, there will be a fairly decent wait between the date content is released and when it’s available for viewing on Amazon Instant. Other options that might not be as popular, but might better match your viewing habits, are Redbox Instant, M-GO, Aereo, and more. Compared to the competition, Sling TV appears to have carved itself a nice—and much-needed—niche within the content streaming industry, by providing access to content that would otherwise be lost without an expensive cable subscription. This includes ESPN, HBO, HGTV, Food Network, TNT, and many others, although some options might require additional money. On top of this, you’ll be able to watch live television with Sling TV, or wait until a few days after it airs. It’s your choice. But we’re getting ahead of ourselves. Let’s first talk about how you can view Sling TV’s content. Which Devices Are Supported by Sling TV? When reading through the Sling TV website, we found it curious that there’s no support for AppleTV, which is the third most popular streaming device, trailing only Roku and ChromeCast. However, according to Sling TV’s FAQ, your WatchESPN account from Apple TV will transfer over, so you’ll still be able to watch these associated networks. Outside of the product’s website, what are people saying about Sling TV? Despite being in business only since January 2015 (as a division of Dish Network), Sling TV already has more than 250,000 subscribers, so it’s an extraordinarily popular service. In fact, type the phrase “Sling TV review” into your favorite search engine and you’re certain to receive millions of hits. With this in mind, TechRadar gave Sling TV a 3.5-star rating. While they appreciated the service’s clean picture, user-friendly interface, and easy setup, they didn’t like Sling TV’s limited content selection, it’s relatively high price, and the fact that you can’t pause a show on one device (such as a smartphone) and easily resume on another (such as your TV). The fact that some channels don’t allow you to rewind live content or watch previous episodes. As with the TechRadar review, CNET’s users recommended that you’ll need to obtain the fastest internet connection you can find in order to fully enjoy the service. Finally, there were more than 1,500 Sling TV reviews on Amazon at the time of our research, with an average rating of 2.9 stars. There, common compliments cited ease of setup/use, access to premium content, and ability to customize your subscription (more in the next section). On the other hand, Amazon reviewers didn’t appreciate Sling TV’s buggy apps, high price-to-content ratio, and inability to pause, fast forward, or rewind some content. From a company perspective, Sling TV, LLC wasn’t listed with the Better Business Bureau, although their parent company Dish Network was. As of 7/28/15, Dish had an A- rating with the BBB, despite having more than 11,500 (yes, you read that right!) complaints. Many of these appeared to reference difficulty cancelling service and higher than expected prices. Admittedly, this doesn’t mean you’ll experience the same with Sling TV. If you’re looking to try Sling TV without a commitment, you can sign up through their 7-day trial. Once this time has passed, you’ll be rolled over to a recurring subscription priced at $20 per month. For a full list of available networks and package options, be sure to check out Sling TV’s Programming page. At the time of our research, Sling TV was running a promotion that offered a free Roku Streaming Stick, 50% off a Roku 3 (total of $49.99), or 50% off a Nexus player (total of $49.50), as long as you paid for 3 months of service in advance. Since pricing is fresh on our minds, let’s quickly discuss costs here. If you’re like most people, you decided to cut the cord and cancel your cable subscription because you were interested in saving money. However, as we saw above, a single streaming device like Sling TV could set you back $60+ per month. Then, if you also factored in online subscription services such as Netflix, Hulu Plus, Amazon Instant, Redbox Instant, and others, you could easily spend as much (or more) than your original cable bill. With all of this in mind, let’s answer the important question: is Sling TV right for you? Can Sling TV Replace Your Cable Subscription? If you watch most of the channels that come with your (even basic) cable subscription, then you definitely won’t be able to replace all of them with Sling TV. However, if you find yourself regularly watching shows on networks such as ESPN, HBO, HGTV, Food Network, TNT, and more, but don’t want the burden of an expensive cable bill, Sling TV might be just what you’re looking for. Remember this though: Right now, Sling TV is the only game in town if you want to live stream content from premium “cable” networks, without a cable subscription, so your options are limited. Read Next: Streaming Services: With So Many Choices, How Can You Pick the Right One? Please don't fall for the 30-day free, cancel anytime and get charged nothing CRAP! I canceled within the 30 days and forgotten I had to give them an account even for the free period. I canceled, they said it was canceled (I neglected to print the screen that said so...never do that again), and because of that, they were charging my savings (which I only check quarterly) three months of charges at $27.48 each! BEWARE that their policy (OF COURSE) is that any money received by Sling TV is NON REFUNDABLE! Don't fall for it unless you want to be charged! Two weeks into my first month with Sling TV, several channels were removed from my selections. I tried to add them back, but was told that I would have to upgrade. The old bait and switch. You are told you get one thing, and then they take it away. Needless to say, I canceled. And based on this, I had better ensure they don't charge me again. Also, Sling TV did not load much of the time. Less than two weeks after signing up, I was billed for a pay-per-view I did not order. After a four-hour hassle, I found out that you cannot talk to their billing department. They were accusatory and said that they could not remove the charge. They said the device used was Android, which we do not own. Simply put, they don’t care. They charge your card and there is no way to dispute. They are a very corrupt and dodgy outfit. A class action is coming their way. You also cannot prevent PPV charges with IOS, or so I was told. They didn’t have a fraud department or billing department number or email that they would provide. I would definitely dispute with your bank. I had the same issue happen as well. Sling has zero Christian shows or channels, I would like to see that change! I want more family-friendly channels like Daystar, TBN, or Hillsong. They have way too many non-Christian channels and shows. I had a 30-day free. I canceled and just now figured out I’m still be charged since canceling last December. John, the manager, did not see any phone calls that I canceled or an email. I document notes always. But he can’t refund me. That’s so WRONG! I already emailed the BBB. And I will post about it on any other possible communication so this doesn’t happen to others. We give you bank card info then you keep it. Because he says it’s recorded. Ok. But apparently, your system isn’t correct! So the customer is screwed. Who owns Sling? I’ll research that myself! And not depend on John, the manager that makes all the decisions. The Roku Ultra FINALLY showed up per Victor's promise, so I did feel a little better about that. Once the simple-to-install Roku was connected, the Sling interface was MUCH easier and more usable, and I'm thinking the 3-month commitment and Roku Ultra deal may be OK. I bought Sling primarily to be able to watch MotoGP on the BeIN channel and college football coming up in a few weeks. The free Roku channels are impressive and unexpected. Netflix through the Roku is also very impressive. So I stand by my conclusions above that are still valid, but for some people, Sling TV may be a good alternative is saving money is very important. Very unhappy after only one week of service! 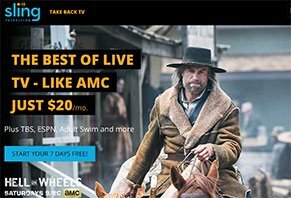 I've heard about Sling TV's "Free 7-Day Trial" for a long time and as my local cable company gave us a 20% increase in our bill this month, I decided to make a change based on cable's price increase. I went to Sling TV's website and looked at their numerous options before choosing to buy a Roku Ultra for $50 in addition to three months of service. Later I found out that I did not qualify for the "Free 7-Day Trial" because I purchased the Roku at a discounted price. So highly recommend trying the Sling TV 7-Day Free Trial before any financial commitment I'm not sure how many people will want Sling TV after a free trial because of so many issues like buffering, pauses, hard to use interface with the app alone, etc. On August 1st, one day after I placed the order online, I received an email from Sling TV saying, "Good news! Your Roku Ultra is on the way. Expect a package to arrive within the next few days. You’ll be watching your personal channel lineup on your big screen in no time." This was NOT TRUE and set me up for an unrealistic expectation! On August 7th, eight days after I ordered Sling TV, I called them to inform them that my Roku Ultra has not arrived. It turns out that their week-old email was a LIE because the Roku had not even been sent, thus delaying it as much as an additional week! I have been playing with the Sling TV app since last week, but it is clunky and hard to work with on my computer and not nearly as easy or convenient without the Roku or other interface. The worst part is the channels often pauses or buffers, and that is REALLY annoying! Sling TV recommends a minimum internet speed of 25 Mbps and my internet is over 100 Mbps, plus I'm hard-wire connected with a CAT-5 cable instead of connecting wirelessly, but still get frustrating buffering when I watch! So I contacted Sling TV today (via chat and phone) asking to cancel my subscription and refund my money. I did so because they had not fulfilled their email promise to me. I politely asked to get out of the contract and have a refund issued, but all three Sling TV representatives/supervisors I talked with told me that it was NOT possible because I agreed to purchase the Roku Ultra and three months of service. I was told, "Sorry you're unhappy, but we can not help you!" I was then promised by Victor that my Roku Ultra would "definitely" be here in three days (this Friday, August 10th.) So IMHO, Sling TV’s customer service won’t help you even if your complaint is fair and reasonable. I’m hoping the Roku will come by Friday and that this interface will make Sling TV a better experience. If not, I will re-connect to our local Spectrum cable and pay three times more for a much better picture quality, better customer service, and far greater channel selection. In hindsight, switching to Sling TV was a bad decision for me. (1) NEVER sign up for Sling TV without a "Free 7-Day Trial," that way you can quit without going through the frustration I did. (2) Be sure your internet speed is high enough, and be willing to accept the fact that your Sling TV program will pause and buffer regardless of your internet speed! (3) The old saying, "you get what you pay for" is most often true! Paying three times as much for cable TV may be worth it as you get MANY more channels with a better interface and no buffering or annoying pauses of your TV programs. Plus Spectrum’s customer service IS far superior…I’ll give them that! If you sign up or have Sling TV, watch out, they may be or may overcharge you. They have been double billing me for nine months. When I called, I was given the run around about having two accounts, which I didn’t, and was told they would not be refunding my money or crediting my account. So I canceled "both" of my accounts today. Watch out, this company are crooks and will rob you then tell you to have a good day. I’ll stick with Netflix and Hulu, screw Sling. I was not able to watch the Fifa World Cup in Portuguese as they told me. Terrible customer support. I have tried several times to solve this issue, but they never did. I have used the basic $20 version of Sling TV for about a year now. I do appreciate the low price, although the actual streaming is very weak. I have used this account on multiple different WiFi connections. On every single WiFi source, the streaming has been very inconsistent. I like the idea of Sling TV, but I do not believe they are capable of holding a solid stream. Time after time I pay for a product that does not meet the standards supplied by the company. Do not trust Sling TV. It is a crappy cheap alternative to typical cable and does not supply what is said to be supplied. First off, giving this company a 1-star rating is putting it nicely! My husband signed us up, or so he thought. They told us about a package that would work best for us. So we got it and paid the amount that was supposed to be for two months (Lie #1). After two days of trying to get our box to work and several calls to the company, we are told we were sent the wrong box. Now we talked to several reps and got so many different stories. We were told labels were coming to be able to send it back (Lie #2). They never came. After several days, we call back. More run around! So we end up sending the box back to the address on the package. More money spent on their mistake, not ours! We are told several times "no refund." So I have to laugh when we cancel. The man told us we have until May 20th to continue enjoying Sling. HELLO, we were sent the wrong box! Your mistake! We haven't been able to watch anything, but they sure did get our money! They lie to you in the beginning, and to be able to get what you thought you were signing up for to begin with, they tell you to pay more money. These people are liars and thieves! I signed up to watch soccer champions league games (which they state that they will cover). I was planning to watch Barcelona vs. Roma (4/10/2018) and 10 minutes before my game, I opened Sling TV's app and I was unable to see it! I call them and they tell me that they have some blocked games that they will not show!! They DID NOT state this in the contract that I signed up for! In addition, last week they broadcasted the same exact game, but all of a sudden, today, they decided to not broadcast it! Also, they are not broadcasting another VERY important game from tomorrow, Bayern vs. Sevilla. I will do my best to sue those thieves, and their company should shut down! Write a Review for Sling Television!